The Late Sec. 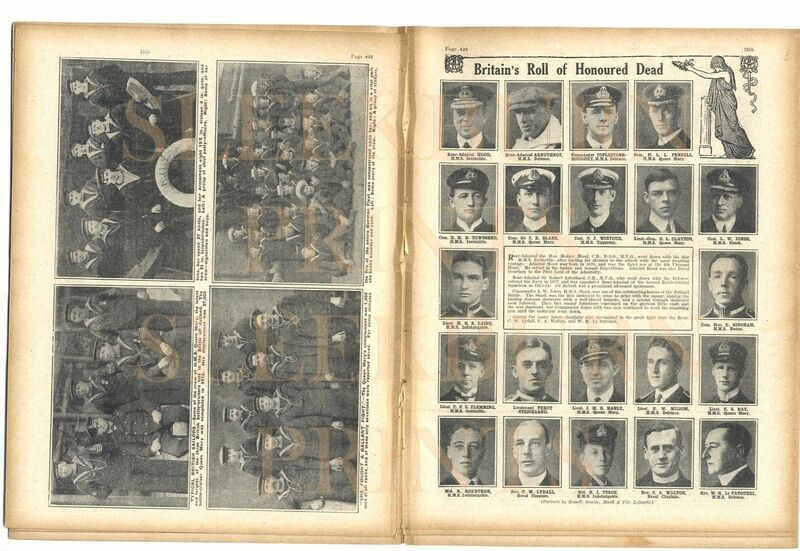 of War Lord Kitchener and Sir William R Robertson - full page (fp) from a photograph. One of the last taken of Lord Kitchener befor the sinking of HMS Hampshire on 5 June 1916. German Submarine Commander Captured with his Crew; Seen Marching to an Internment Camp - hp. The U Boat in a French Dry Dock. Salonika: General Sir Bryan Mahon and Lord French's Sister Mrs Harley of the Scottish Wopmen's Hospital, Watching an Aeroplane in Flight - with two tohers incl another lady. Salonika: Communicating with HQ by Flag and By Helio. General Zimbrakakis of the Greek Army, Contemplating a British Gun with Admiration - hp. Anzacs in Egypt: Australian and New Zealand Mounted Troops Delivering an Attack on an Enemy Post in The Desert of Bir Salmana, near Katia - fp from a drawing. Hanging Out the Washing in Mesopotamia. Indian Soldiers in Mesopotamia: Roll Call Before Going into Action. Slav Soldiers on the Western Front . Russian Soldiers Entraining to The Austrian Front. The Fort of Douaumont: The Shell Shattered Slope Before the Fort Where Men Were slaughtered in Thousands. Battery of French 75 Guns in Action Behind Fort Douaumont - hp. Small Chart of the North Sea Indicating the Area of the Great |Naval Battle off Jutland - it shows relative distances between Heligoland and importan points on the British coast . Armoured Cruisers of the German Fleet Steaming Out to Sea. 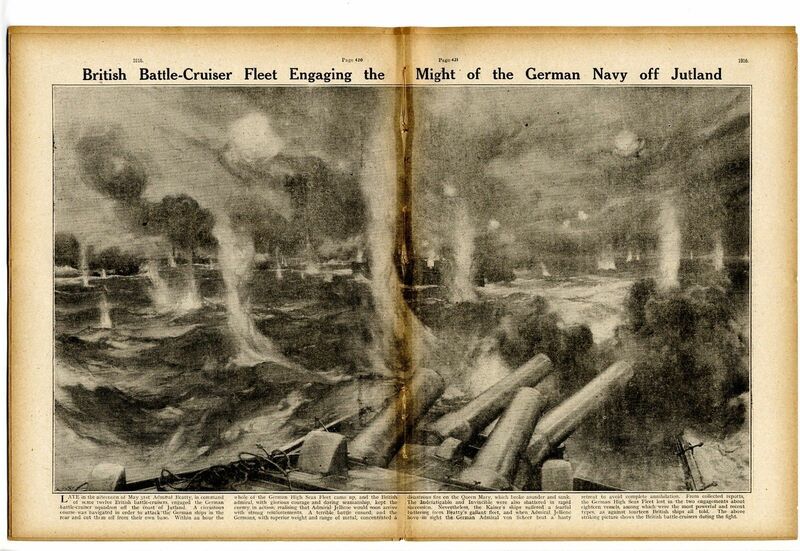 British Battle Cruiser Fleet Engaging the German Navy off Jutland - double page (dp) from a drawing by CMP. Info. C. M. Padday or Charles Murray Padday RI, ROI (1868–1954) who was a renowned British artist and illustrator. There is a caption article beneath the drawing of approx. 200words. 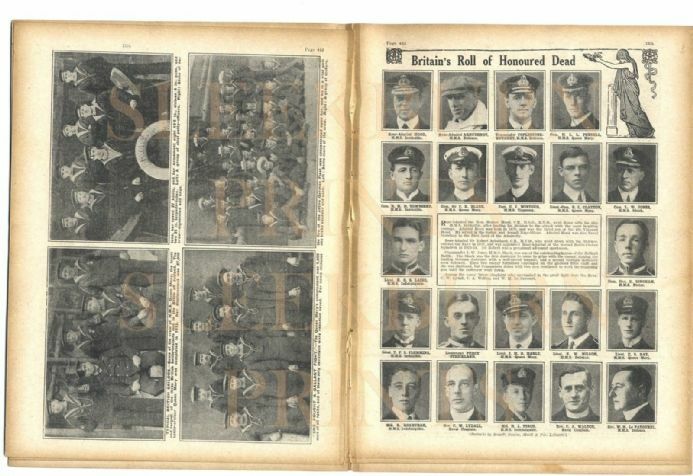 Typical British Sailors: Some of the Crew of HMS Queen Mary the Largest of the British Battle Cruisers Lost in the Battle off Jutland - fp showing x4 photos. Showing a group of Chief Petty officers; Some of her signalmen and boys; More crew; and a group of Stokers. Rear Admiral Horace Hood - HMS Invincible. Rear Admiral Robert Arbuthnot - HMS Defence. Commander Coplestone-Boughey - HMS Defence. Com. H. L. L. Pennell - HMS Queen Mary. Com. R. H. D. Townsend - HMS Invincible. Com. Sir C. R. Blane - HMS Queen Mary. Captain C. J. Wintour - HMS Tipperary. Lt. Com. R. L. Clayton - HMS Queen Mary. Com. L. W. Jones - HMS Shark. Lt. H. G. S. Laing - HMS Indefatigable. Com. Hon. E. Bingham - HMS Nestor. Lt. T. F. S. Flemming - HMS Invincible. Lieut. J. M. B. Hanly - HMS Queen Mary. Lt. E. W. Milsom - HMS Defence. Lt. E. S. Ray - HMS Queen Mary. Midshipman R. Roxburgh - HMS Indefatigable. Rev. C. W. Lydall - Naval Chaplain. Midshipman H. J. Tuson - HMS Indefatigable. Rev. C. A. Walton - Naval Chaplain. Rev. W. H. Le Patourel - HMS Defence. German Ships Rehearsing for Jutland Battle, Firing Broadsides. Clearing the Decs for Action - an enemy photograph of the German Navy at work. 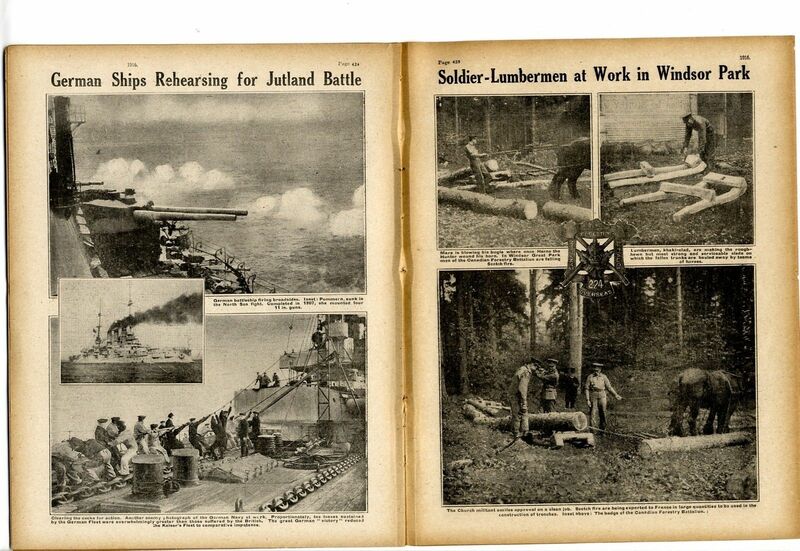 Soldier Lumbermen at Work in Windsor Fark: the Canadian Forestry Battalion 224 Overseas - fp showing x3pics. Heroic Italian Aviator Capt Salomone Attacked by Fokkers ; His Two Comrades Killed - from a drawing. Two British Airmen on Being Attacked While Overhauling Their Plane, Take to Their Gun and Drive off the German. German Aerial Liveliness over a British Position at Salonika Treated as a Joke by Our Soldiers. French Aviator Repairing his Machine After Being Hit by a Fokker. Austrians Prepare for New Russian Offensive - fp showing eight pics. Bulgarian Troops Entering a Town in the Balkans with The Band Playing. German Landsturm Marching Through a Macedonian Town. German Troops in a Macedonian Town Buying Tobacco From a Serbian Pedlar. The Marquis and Marchioness of Bath Have Converted Longleat into a Relief Hospital: Nurses and Patiens next to a Fountain. Longleat: A Nurse with Wounded on the Terrace. Recovering Soldiers by the Waterfall at Longleat. Enemy Opportunities Lost Through The Incompetence of Wilhelmstrasse - Article by Sidney J. Low. Chronological list of events, 1 May to 31 May. Earl Kitchener Drowns After HMS Lancashire Sinks After Striking a Mine - fp article entitled A Memoir. If there is a particular date you require eg. for a Birthday or anniversary etc please ask. This magazine is an original and used issue, not printed on the best of quality paper, but it more than makes up for this in terms of written content with many images. The four digit number in brackets in title is for my ref only. It measures 285mmx220mm (11.25 x 8.5 inches) approx. The spine is loose with binding witness marks. There is age yellowing and spotting/foxing and some marking. There are some creases etc to corners. There are handling marks to the edges. The photographic images, sketches etc. vary in size. PLEASE NOTE: I cannot guarantee that the issue is complete 'as published' - but what I have described above IS present. As far as I can tell there are no pages missing, but if you are looking for something in particular in this issue PLEASE ASK. If you require information on size of articles (i.e. number of words), sizes of images, please ask before bidding or buying. This item will be packaged in a board backed envelope. The descriptive text in my listing, details the content in my words and not necessarily what is written on the original page."Info." in the description is my research, although relevant to the accompanying image or article, is not necessarily in the text.